New England offensive coordinator Josh McDaniels confirmed he interviewed over the weekend with Cleveland owner Jimmy Haslam and CEO Joe Banner. 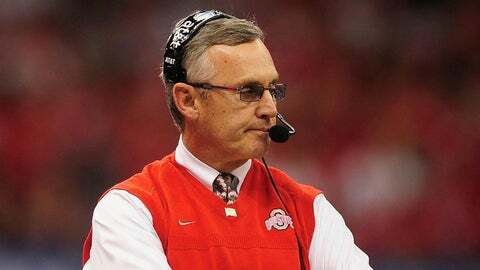 CLEVELAND (AP) — The presumed favorite in the Browns’ coaching search says he’s in the running. New England offensive coordinator Josh McDaniels confirmed he interviewed over the weekend with Cleveland owner Jimmy Haslam and CEO Joe Banner. The team is searching for its second coach in a year and seventh since 1999 after firing Rob Chudzinski last week. "We met and that’s about all there is at this point," McDaniels said Monday during a conference call. "Nothing further." The Browns began the second week of their search with no conclusion in sight. McDaniels wasn’t offered the job because NFL rules prohibit teams from making offers to assistant coaches on playoff teams until they are out of the postseason. Even if the Browns want to hire McDaniels, they can’t discuss a contract with him until New England’s season ends. The Patriots play Indianapolis on Saturday in a divisional playoff. McDaniels, who went 11-17 as Denver’s coach before he was fired, did not divulge details of his meeting. "The opportunities are certainly flattering if they come up," said McDaniels, a native of Canton, Ohio. "That being said, I am going to try to keep my focus on the Colts and our preparation this week. Like I’ve said in the past, I’m fortunate to have the job I have, and I love being here. I love doing what I’m doing. Each opportunity that comes along is a little different and I’m going to leave it at that and continue to put my effort and attention into the Colts this week." McDaniels is one of three candidates known to have interviewed with Haslam and Banner. The Browns’ top brass also interviewed Seattle defensive coordinator Dan Quinn and Arizona defensive coordinator Todd Bowles. The team also requested permission to interview Denver offensive coordinator Adam Gase, but he declined the chance to meet with the Browns or Minnesota Vikings because he didn’t want to be a distraction during the Broncos’ playoff preparations. Denver hosts San Diego on Sunday. 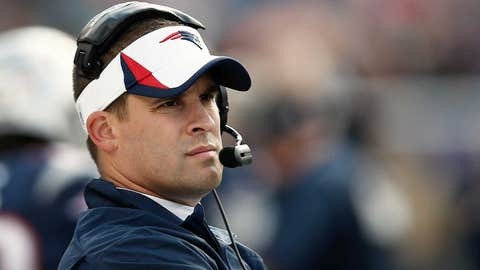 McDaniels immediately emerged as the front-runner to wind up in Cleveland, based mostly on his association with Patriots coach Bill Belichick, who has worked with Browns general manager Michael Lombardi. Banner, too, has always thought highly of McDaniels, who may be better suited for a second go-around as a head coach after some tough lessons learned in Denver. The 37-year-old McDaniels clashed with quarterback Jay Cutler and wide receiver Bandon Marshall and made several questionable personnel moves as the team’s de facto GM. It’s still possible the Browns will hire a college coach. Bob Stoops, though, isn’t the one. A person with direct knowledge of Cleveland’s search told The Associated Press that the Browns will not interview Oklahoma’s coach, who has deep Ohio roots. After his Sooners stunned Alabama in the Sugar Bowl last week, Stoops did nothing to dispel a report that said he had the "inside track" for the Browns’ job. But the person who spoke to the AP on Monday said the team is not pursuing him and that any reports saying so are "false." The person spoke on the condition of anonymity because of the sensitivity of the search. Stoops said "you never know" when asked about the possibility of one day coaching in the NFL. His vague remarks fueled speculation about Cleveland’s coaching vacancy. Stoops is from Youngstown and has been linked to the Browns in the past. Cleveland is also reportedly interested in speaking with Auburn’s Gus Malzahn and Vanderbilt’s James Franklin. Malzahn will be available for an interview after Monday night’s BCS national title game against Florida State. He doesn’t have any NFL experience and he has made it clear he’s happy at the school, but that may not prevent Haslam and Banner from making a strong run at him. The Browns were enamored with Chip Kelly during their coaching search last year, but after a short courtship, the former Oregon coach decided to sign with Philadelphia. Franklin has one year of pro experience as Green Bay’s wide receivers coach in 2005. He led the Commodores to a 9-4 season and a win over Houston in Sunday’s BBVA Compass Bowl. Franklin’s impressive turnaround at Vanderbilt has caught the attention of Haslam, a Tennessee alum. Vanderbilt went 24-15 in three seasons under Franklin, who left the interview room following the win without replying when asked if he would be back at the school.